I really, really wanted to love frosting and food colorings. But I don't. They might look good and yummy, but my cultural background is always there, reminding me that colors and frosting were (at that time) just for industrial cakes. This was the common sense when I was a kid growing up in the early 70's back in my home country. So, when I started baking cupcakes for my kid's birthdays to celebrate at school, I was always facing the dilemma: to top them with frost or not? After a couple of years testing an alternative for covering cupcakes, I found a very easy and healthy one, tested about five times, that had an amazing result on preschoolers. My goal was always to have the kids eating cake and not just what was covering them. So, instead of cake mix boxes, I adapted one recipe of yellow cake from Wiltons, changing its ingredients. The secret is to give each cupcake a swirl of the kid's favorite jam: Bonne Mamán Raspberry Jam. After baking them I covered the beautiful little yummies with irresistible fresh blueberries and half strawberries, using sprinkled powdered sugar as a last cover. Believe me, after eating the fruit they really go for the cake. Sift all dried ingredients together. Preheat oven to 350 F, and while oven heats, beat butter and sugar to a fluffy creamy texture. Add each egg, one at a time, to mix and vanilla extract at the end. When all looks creamy, start adding milk and flour alternately. Beat until mix looks homogeneous and well-integrated. Pour batter in the cupcake cups. Pour jam into freezer bag and open a tiny slit at the end of one of its tips. Squeeze a swirl of jam in each cupcake. Bake for about 25 to 30 minutes. While cupcakes are still cooling, sprinkle powdered sugar with the help of a strainer over each of them and add the pieces of fruit. Add more sugar at the time of serving. Last week was all about baking. Cupcakes, Holiday cookies and birthday cakes were still in my mind - and palate -while I was planning the playdate menu. French Vanilla scent was still exhaling from fresh batter and present in he whole house when I began to develop this recipe. Such a familiar smell would probably be too predominant to let me cook something unusual. But, as I heard once, adversity may act as fuel for creativity. And that lunch would either be a success or disaster. I wanted to test a very simple recipe for the kids. And that was pasta with three cheese sauce. On the other hand there was something there - an antidote for all those sweet goodies and comfy food. 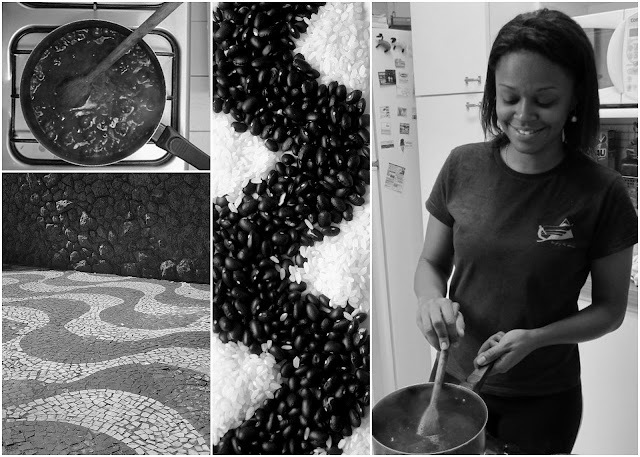 So, in bout of pure instinct and need for excitement, I chose to cook some novel ingredient in my pantry: And that was the beginning of a new adventure with Wild Rice. The result was a multi-textured dish with delicate taste and unexpected ingredients that were like a party for the mouth. Kids were navigating in a more comfortable zone of pasta and Parmesan cheese. But my older boy was too attracted to the looks of the dark rice not to try it. Unfortunately he was not pleased by the texture and nutty taste of the rice. But for the grown ups it was a success. And that was good enough to cheer me up on that busy Friday of endless baking. A good brand of Brie cheese will do the trick on this recipe. Be careful not to overpower it, and use the amount recommended below as a reference. 1 cup pieces of Brie cheese, divided in 2 parts. Cook rice as directed in package, with salt and garlic. When almost cooked (about 5 minutes before the timed cooking time), add soy beans and blueberries. When all ready and al dente turn off the heat and add part of the Brie to the rice and stir carefully. Add more brie and chopped apples to the rice when dishing the food. Serve it hot. For years, I was under the impression that popovers were impossibly tricky, prone to collapse unless coddled in their own special popover pan. And now I'm kicking myself for missing years of popover happiness. They're so easy, my 5-year-old could make them himself if he wasn't afraid of the blender. We use an ordinary muffin pan. I love their versatility as a snack, a breakfast treat, or even a light meal. Serve them humbly on their own, with a bit of butter, or dress them by filling with chicken salad. At a recent playdate, I paired cardamom-kissed popovers with hard-cooked eggs and persimmon and fennel salad. The kids passed on fruits and vegetables, but they devoured the popovers, both plain and with a touch of maple syrup or apple butter. I imagine lemon curd would be tasty with these. Best of all, they're fun to bake with kids. 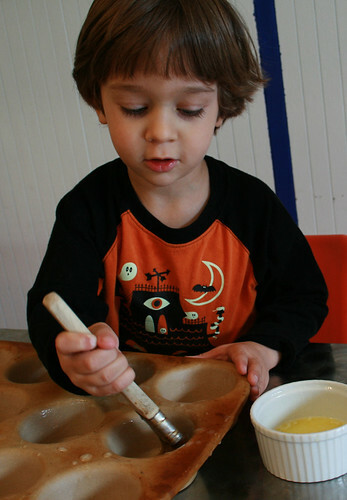 Hand the little ones a pastry brush and let them coat a muffin pan with butter. Put the batter in a small pitcher or measuring cup and help them fill the cups. Then turn on the oven light and peek through the window -- don't open the door! -- to watch the magic. For a delightful breakfast treat, try dipping your popovers in cinnamon sugar with David Lebovitz's recipe for Sugared Puffs. Do you have a favorite popover topping or filling? This makes 9 popovers in a muffin pan, or 6 in a popover pan. If you don't care for -- or have -- cardamom, substitute cinnamon, nutmeg, or allspice. Beat egg in medium bowl. Add milk and whisk well to combine. Stir in flour, cardamom, and lemon zest until smooth, then let batter rest for 30 minutes. Alternatively, you could combine the ingredients in a blender briefly. Preheat oven to 450 degrees. 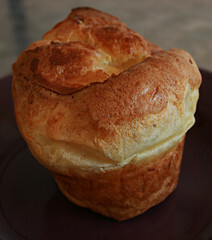 Brush muffin or popover pan cups with butter -- kids can help with this part. Fill about half to two-thirds full with batter. Bake for 15 minutes, then reduce heat to 350 degrees and bake for 15 to 20 minutes more. Do not open the oven while the popovers are baking! Remove popovers from pan and enjoy while still hot. Apple butter is my favorite topping; you could also serve with butter, syrup, jam, or lemon curd. 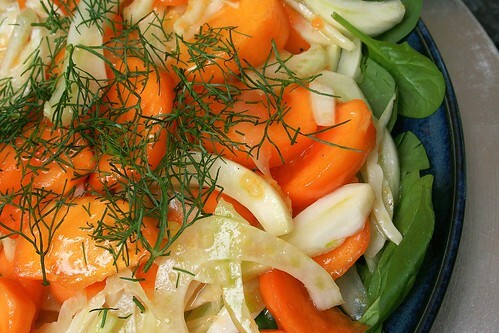 This easy, delicious salad has only three primary ingredients: fennel, persimmon, and preserved lemon. If you're aren't familiar with all of them, it's time to be introduced -- they're all in season now. Your taste buds will be forever in your debt. My 5-year-old has been on a persimmon kick, but I was bracing for him to balk at trying it with any seasoning. To my surprise, he loved it. Unfortunately, he was in kindergarten Friday and couldn't encourage his friends to try our new favorite salad. But they were happy enough to munch on delicately spiced popovers and Granny Smith apples. The secret to the flavoring of this salad is preserved lemons. They're common in Moroccan food, and you'll find lots of tagine recipes requiring them. I've never made a tagine, but I've added preserved lemon to seafood, vegetables, grains, chicken, and salad. All you need are some lemons, kosher or coarse sea salt, a jar with a tight lid, and a month to watch that sunshine-yellow jar with anticipation. While you wait, however, you can enjoy this salad with simple lemon zest. The preserved lemons will stay good for a year or two. Fennel, also known as sweet anise, looks a bit like celery. This recipe uses the fat bulb and the dill-like fronds; you can also use the stalks just like celery and enjoy with dip or flavor soups. Persimmons are plentiful around here. Fuyu persimmons, used in this salad, are round and best enjoyed on the firm side. Hachiya are somewhat heart-shaped and need to be very ripe and soft (I use those for baking). If you have still more persimmons, try Winter Jewel Salad, with persimmon, pomegranates, and dates in a cinnamon-orange dressing that tastes like fall, and Persimmon Compote, which is delicious stirred into yogurt or oatmeal or spooned over ice cream..
You probably won't need to add salt if you use preserved lemons (recipe below). Combine preserved lemon or zest, lemon juice, and olive oil in a large bowl. Whisk to combine. Wash fennel bulb and remove any tough outer layers. Cut the stalks and fronds just above the bulb and set aside. Cut bulb into quarters and remove the tough core. Thinly slice fennel and put in a large bowl. Peel persimmons and cut into eighths; add to bowl. Stir gently, taste, and add salt and pepper to taste. Serve on top of baby spinach leaves and sprinkle with chopped fennel fronds. 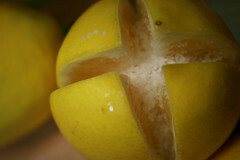 Use organic lemons -- you eat these peel and all, and it's worth the trouble to find ones that haven't been sprayed. Be sure to have enough lemons to fill your jar, plus extras for juice. Sterilize your jar and lid by boiling in water for 10 minutes. Scrub lemons well. Cut away any stems. Slice the lemons almost completely in half, but not all the way through. Make another cut, perpendicular to the first, so you've cut the lemons nearly into quarters. Pack the cuts with salt and put lemons in the jar. Pack firmly! Add any spices, if you wish, and add enough lemon juice to completely cover the lemons. Shake the jar every day or two to evenly distribute juice and salt. As lemons soften, add a few more. After a month, your lemons are ready! They're very salty: Rinse before using, and taste before adding more salt to a dish. I've been assured the jar never needs refrigeration, but I stick it in the fridge after opening it. The pickling juice can be reused over the course of the year. Every so often my pantry suddenly is overstuffed with packaged snacks: cereal bars and crackers and cookies and chips and so on, and yet no one can find anything they really want to eat. Enter Fix Me a Snack, a great blog by mom-of-two Cindy that sets out to offer "a healthier approach to family-friendly snacks." It's a wonderful resource for getting out of a snack rut. 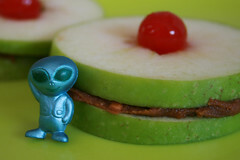 My older son clicked through the site and picked a few he wanted to try: Apple Flying Saucers were an instant hit. My younger one is averse to nut butter, so yesterday we tried the saucers with the brilliantly simple Mud Dip, with chocolate disguising the taste of sunflower butter. (And toy aliens. But he still didn't go for it.) I'm also eyeing the Oatmeal Sundae, which just might wean my kids off their addiction to oatmeal with "dinosaur egg" candy. But Fix Me a Snack goes far beyond just making healthy food cute. There are interesting recipes for crispies, muffins, puddings, balls, and more. There's even an alternative to Jell-O flavored with coconut water and pomegranate juice. You can find snacks that can be whipped up in 10 minutes or less and honor seasonal eating. Chocolate chips and whipped cream aren't banished, but are used in moderation alongside healthy stars. I'm all for healthy moderation. Our biggest success has been the sweet potato fries. I've tackled these a dozen different ways, and they always ended up too mushy, too crispy, too flat-out burned. But these are perfect, and even my sweet-potato-hating, picky-eating husband likes them. What are some of your family's favorite snacks? See, Touch and ...Taste Mickey ! Disneyland smells like candy, looks like candy and... Guess what? Has tons of candy to sell. Meet Mickey, the frozen chocolate cream bar. Buy Mickey, a strawberry lollipop. 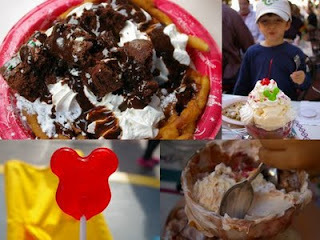 Have a Matterhorn Sundae, sprinkled with Mickey shapes. So, in three days we saw and tried lots of food. For the good and healthy eaters, not so tasty salad with not so many calories. For the average hungry eaters, there were not so creative sandwiches with obvious chips on the side. For those who can eat it all, some unforgettable providers of energy and sugar highs were all there: from nice-looking fruit boxes to unbelievable magic desserts that looked like animated characters. Here are some tips on what to choose and, of course, one recipe inspired on one of the best surprised I could ever imagine eating at dreamland: funnel cake. Healthy Disneyland trip: Almost all corners have a fruit stand where you can buy cups filled with fresh fruit. Or perhaps a wholesome fruit? Good-looking bananas and apples are all there. At Toontown Mickey you can even buy a yogurt parfait with granola, fresh berries and yogurt. Salad Bar Trip: Believe me, even with different names they are all basically the same. Lettuce, ham, boiled egg, smoked turkey, some tomatoes and carrots are the options for those not willing to surrender to wonderland food. Magic Sweet Disneyland Experience: Go for the Matterhorn Sundae at Carnation Cafe. Don't hesitate to visit the Mint Julep Cafe Bar at the French Market (close to the Pirates of the Caribbean Ride) and order a funnel cake with brownies, chocolate fudge and cream on the top. Absolutely heavenly!!! And of course, walk all two parks six times to spend all those calories quickly. Coffee Lover: If craving a strong espresso go for Carnation Coffee, right on Main Street. They have a nice one, served in charming pots. Also Mint Julep's little coffee shop has a good and strong one, comme il faut. Pirate Experience: We wanted badly but finally could not make it: The Blue Bayou Restaurant is dark and cozy inside the Pirates of the Caribbean Ride and was mentioned in many places as the best place to eat a Monte Cristo Sandwich. I thought this was amazing: deep-fried club sandwich? Primate Earthy-Looking Experience: Just not good-looking, but very popular whole legs of smoked turkey were happily devoured around the grounds of the Matterhorn ride. I later found that some people go crazy about it. I just didn't have the courage after Thanksgiving dinner. Thanksgiving Dinner: Yes, you can have it all. They have a kid's portion and it is all there. I promise you that the mashed potatoes were the best ever. So, here is a recipe compiled from about three sources of well-known chefs. Most important of all: check if you have the necessary amount of oil in your pantry before beginning! In a bowl mix eggs, sugar, milk and vanilla. When smooth add gradually flour and baking powder. Heat oil to a frying point in a deep skillet. Add 1/2 of the batter in a funnel and pour it over the hot oil in circular movements. Fry each side up to when golden and use tongs to turn it. When ready put it on a kitchen towel to absorb the excess oil. The Rachel Ray solution to pour the batter is to use a plastic food bag and cut one of its tips to imitate the funnel.